What's Karl Marx Doing In These Arguments Against College Athlete Pay? The value of a commodity … can be measured according to the amount of socially necessary labour- time that was invested in its production. "It is hard to justify paying student athletes in football and men's basketball and not recognizing the significant effort that swimmers and wrestlers and lacrosse players and track athletes all put in," he said. "Football and basketball players don't work any harder than anybody else; they just happen to have the blessing of an adoring public who is willing to pay for the tickets and willing to buy the products on television that come with the high visibility." In my opinion, it would be unfair and inappropriate to take a portion of this funding away from other sports in order to pay football and men's basketball players for participating in televised games just because they happen to participate in a sport in American culture that audiences are willing to pay more to watch and that broadcasters will pay more to broadcast. In contrast with Marx, who felt that the products of labor are best valued based on the quantity of labor that went into the product, capitalism generally says the products of labor are best valued according to market demand (and alternate sources of supply). So if you see people paying more for, say, an hour of a conference commissioner's time than for an hour of the conference commissioner's secretary's time, that means the market places a higher value on the former's labor. It's not all that hard to grasp—we expect scarcer talent to earn more because we're so deeply steeped in the economics of capitalism that it's second nature to us. By this theory, the fact that football and men's basketball players "just happen to have the blessing of an adoring public who is willing to pay for the tickets and willing to buy the products on television that come with the high visibility" (per Bowlsby) or "just … happen to participate in a sport in American culture that audiences are willing to pay more to watch and that broadcasters will pay more to broadcast" (per Slive) is precisely why they should be paid more. Higher demand for scarce talent will drive up the price in a free market. The world of college sports highly values the contributions of the men who play sports that don't generate TV money, and it believes that if they are no longer part of the community, the community will suffer. If rules prohibiting football/basketball athletes from getting pay are loosened, the first thing the world of college sports will do is stop funding the scholarships of the men who play those non-money sports. Bowlsby and Slive both run conferences with fundamentally unequal pay scales for all member schools' employees, most notably head coaches. Bowlsby and Slive run conferences with fundamentally unequal scholarship payments for athletes in different sports, even the very athletes that Bowlsby himself pointed to. And they actually have put in rules to guarantee that inequality persists, rather than to remedy it. This was an unusual year because Beebe got a golden handshake on the way out the door, but here is what a more typical year (2010-11) looked like for these same five individuals. It's pretty hard to see equal compensation for equal number of hours in those charts. And while I am not going to argue that Bowlsby isn't worth 50 percent more than Beebe, I might quibble with the idea he is working 50 percent harder. Bowlsby said it's really not fair if a member of the swimming team gets less than members of the football or basketball teams, just because the public likes football and basketball better than swimming, but apparently that message has not made it down to Austin, where the men's swimming coach—of a very successful program that won a national championship in 2010—made something around 5 percent of what the football coach made. Put it this way–if Mack Brown belongs to a church that encourages tithing, and he tithed that year, his contribution could have purchased two men's swimming coaches. Despite the Bowlsby Dictum, which says the because wrestlers really work just as hard as football players, they deserve equal compensation, wrestlers receiving scholarships from Oklahoma State are earning 29 percent of what football players are earning to play for the Cowboys. What gives, Comrade Bowlsby? Some of this is because of NCAA collusion to limit compensation to wrestlers. Yes, I said wrestlers–turns out there is a rule that says no matter how much a school values its wrestlers, and no matter how many wrestlers it would like to recruit, it can offer no more than, yep, 9.9 scholarships per year. So if you have a wrestling team with 27 scholarship athletes, as Oklahoma State does, NCAA rules (which are also the product of collusion among the D1 schools) limit you to giving an average scholarship somewhere just above one-third of a so-called "full ride" (9.9/27). So you can't actually pay the wrestler the same amount in scholarship aid for the same hard work. You can't do it now, even if you want to. 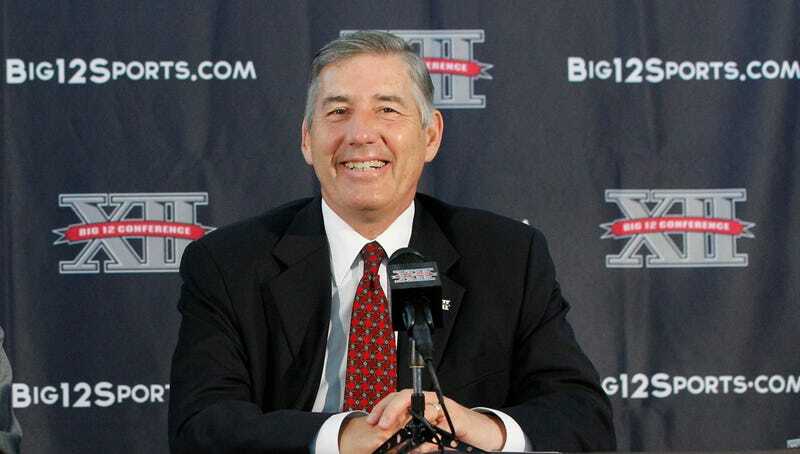 Which is sort of weird if you're trying to say that Bob Bowlsby is in any way consistent in his beliefs. Does he support the idea that all hard work is equally valuable and thus he should be paid no more than anyone else working on his staff? Apparently not. And he's silent on the issue of coaches' pay, though you'd think a hard-working swimming coach ought to make more than 5 percent of an equally hard-working football coach's pay. But Bowlsby does say that with respect to athletes and financial aid, everyone should get the same thing, because they all work just as hard and it's just an accident of fate and popular opinion that they have more worth in a capitalistic economy. And yet his conference and every school in his conference is in an active pact not to do that—they all agree to give wrestlers and swimmers less than football players, and it never once crosses their mind that this is wrong. Leaving aside the question of whether I could buy into the Marxist labor theory of value inherent in that view, I know I couldn't handle the cognitive dissonance it would require to hold that belief while seeing it go unapplied pretty much everywhere else in my organization, including for the very athletes I used as my example of how things should be. But I guess Bowlsby has a more nimble mind than I to be able to juggle those contradictions with such aplomb. Andy Schwarz is an antitrust economist and partner at OSKR, an economic consulting firm specializing in expert witness testimony. Follow him on Twitter, @andyhre.